When you really think about it, a cemetery is a great place to appreciate trees any time of the year. I don't find it morbid at all! 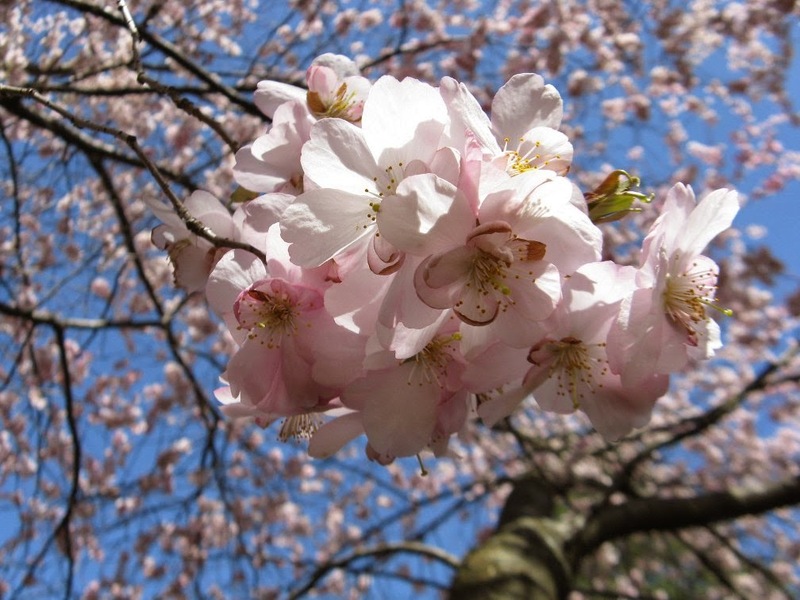 Right now, members of the Prunus genus are strutting their stuff, to mix metaphors, and since my last post "Sakura dreams: Cherry blossoms at the University of Toronto" seems popular, why not give the reading public more of what they want? My family and I spent a few hours bike riding (them) and staring at the spring blooms (me) recently on a beautiful afternoon at the cemetery. I think this beats going to the mall any day! Mount Pleasant Cemetery in Toronto rivals any local arboretum. Many visitors jog, ride their bikes, pay their respects, and a few, like me, wander around appreciating the foliage and flowers. Spring and fall are special times to visit for the botanically-inclined. Food for thought: if you were to pick a memorial tree for yourself, what would it be and why? Nearby, a Leonard Messel magnolia (Magnolia x loebneri "Leonard Messel") was in full bloom. I didn't crop out the statue and marker since the grave does reinforce the idea that the blooms, like ourselves, are only here for a short time. We might as well enjoy ourselves and others while the opportunity exists! I don't find the Japanese flowering cherries very fragrant. This can't be said for the several weeping American plums found in the cemetery. Prunus americana has a sweet odour and the specimens here were covered by pollinators (bees and flies that are, bad pun intended, wanna-bees) hungry for nectar.